BC Hydro has sent out a large amount of letters to their Analog customers, written in such a way that it is aimed to get people to freely give up their ANALOG meter. at least it was said to be, written in black marker on the meter, and in the digital display it stated it was OptOut, yet a RF detector clearly shows it was emitting. How can customers with concerns, and others with major health issues take this risk? Why is BC Hydro so determined to get 100% of BC over to smart meters? QUESTION : ARE RADIO-OFF METERS SAFE? According to BC Hydro, 120 meters were incorrectly formatted (shown below in the video) and emitted wireless even though they were displaying OPT OUT. RADIO-OFF TESTED : A BC Hydro customer contacted one of the teams that do RF measurements to measure their Radio-Off Smart Meter (Itron Centron II). The location was not in a city, so it was not close to other homes or wireless networks. The Radio-Off meter appeared to be safe, with no wireless, completely off. For anyone that is being contacted and pressured into giving up their Analog, it appears to be 100% safe – as long as it remains Radio-Off. These Meters will still require the same Meter Readers who were reading your Analog manually. The question about Dirty Electricity : This home did have some high Dirty Electricity readings. Filters did help. A new reading to see if Radio Off Smart Meters cause DE will be conducted soon, comparing the DE levels before and after a Radio-Off. Opt-Out and Opt-in Programs Across the U.S.
An increasing number of states and/or utilities are offering opt-outs of smart meters. While smart meters should be banned—along with all other wireless devices and digital electrical meters—until they are made safe for humans and other organisms, at least opt-outs provide some relief from the harm of EMFs. Below is a table of smart meter opt-outs and opt-ins. Eugene, Oregon, offers an opt in to smart meters. Analog meters are definitively offered as the opt-out meter in four states: Arizona, California, Maine, and Texas. The Nevada public service commission urges the utilites to provide the meter that will have the “greatest customer acceptance,” which, clearly, is the analog. Three states offer the “existing meter” as the opt-out meter. An existing meter might or might not be analog. Georgia, Hawaii, and Consumers Energy in Michigan. Three states let the utility decide: Florida, Maryland, and Nevada. The Nevada public service commission urges the utilites to provide the meter that will have the “greatest customer acceptance,” which, clearly, is the analog. Four states or utilities definitively forbid analog opt-outs: Fountain in Colorado, DTE in Michigan, Central Hudson Valley in New York (AMR), and Port Angeles in Washington (touted as the first place to ban smart meters—not much help you are required to have a digital meter on your home!). Two states/districts require smart meters: Pennsylvania and Washington, DC. The remaining states with opt-outs have policies that are unclear or that do not provide for analog opt-outs. Opt-outs that do not provide for analog meters are the least useful, because of the harm from dirty electricity. Opt-outs like that currently in Michigan and other states that simply turn off the radio that transmits to the utility but leave in the transmitter, antennas, and the ZigBee wireless radio are the absolute worst. Note that the AMR meters offered by utilities like Tucson Electric Power (TEP) are as dangerous as the regular smart meter. They are not a drive-by AMR meter that wakes up only when someone with handheld device drives by. They communicate with the utility every 30 seconds according to the information on TEP’s own website, often via collection towers. In some instances, their signal is picked up by drive-by meter readers. Regardless, any AMR meter and any digital meter generates dirty electricity. The only meter that does not generate dirty electricity or emit RF is an analog meter. SmartGridLegalNews provides periodic, but not always up-to-date, news on smart meter opt-outs. Over 50 local governments in California have voted to ban smart meters. See StopSmartMeters.org for a list. Unincorporated areas of Marin County vote to ban smart meters for another year. The Board of Supervisors, declaring “a current and immediate threat to public health, safety and welfare,” outlawed installation of the meters but left enforcement issues up in the air. The state Public Utilities Commission, and not the county board, has jurisdiction over the Pacific Gas & Electric Co. meter program. County supervisors also agreed to post information about Smart Meters on the county website, and consider appointment of a “point person” to help residents with questions about meter matters. PG&E’s Brittany McKannay said 191,931 Smart Meters have been installed in Marin, and 3,495 customers have opted out. February 4, 2014. Fairfax Town Council in Marin County, California unanimously votes to impose three-year ban on the installation of Pacific Gas and Electric’s smart meters. Fairfax Mayor David Weinsoff said that when the Fairfax Town Council conducted public hearings on smart meters in 2010, the community’s opposition was overwhelming. “When a community speaks so loudly and so wisely, really there was no question that the council should continue to impose this moratorium,” Weinsoff said. Just like DTE, the California utility says that local entities cannot impose a moratorium. Several California governmental entities, including the Fairfax Town Council and the Marin County Board of Supervisors, have filed an administrative challenge to California’s opt-out ruling. Fairfax Councilman Larry Bragman says that the meters are a poor investment of ratepayers’ money and that “there are potential health effects that have not been fully studied. The impact to privacy has not been dealt with effectively by the California Public Utilities Commission (CPUC). That is becoming more of an issue, now that the awareness of privacy issues has become so much more a matter of public concern.” February 10, 2014. Opt-In in Eugene, Oregon. Eugene, Oregon’s municipal utility, EWEB, requires people to opt in to smart meters. People can keep their existing meter, which may or may not be an analog. City of Eugene Resolution No. 1322, October 1, 2013. Port Angeles, Washington Bans Smart Meters But Requires Digital Meters. 2. Hang “Corix No Trespassing”signs beside your Meter AND on your front door! Find templates at stopsmartmetersbc.com under “Take Action” or “Printables”. Attach signs in Ziploc or plastic sleeve beside meter; do not cover face of meter. Send letter by email and registered mail. 3. 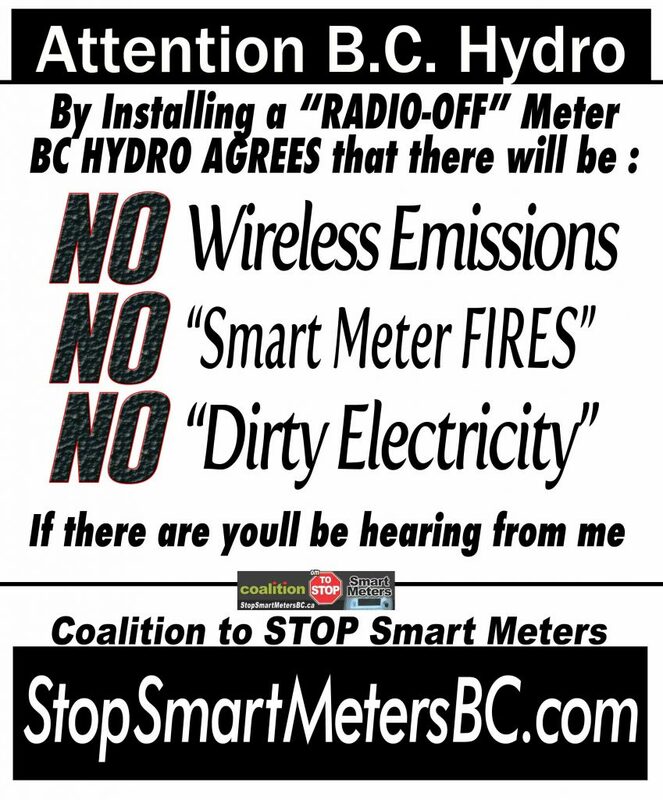 Join the Coalition www.stopsmartmetersbc.com to get updates. See Citizensforsafetechnology.org “Smart Meter Action Kit” and sign on-line petition. choose “Billing & Payment Matters”. the Installation of a Smart Meter”! Be insistent. Thank you for this information. I will do all that is suggested. I am prepared to take a stand on this issue as I know for certain that my health would be affected by this technology. Friend Lisa, a pharmacist in Vernon had a meter installed on her home, no warning, no permission, now gets monthly bills. I am 20 ft from a bank of hydro meters, what’t the point in stopping my Smart meters if 32 others are beaming thru my home?? People in here are not bright enough to care, can’t organize them to resist. I need to move out??? I haven’t had a Smart meter installed yet, but like the HST fiasco, I resent the fact that the government and B.C. Hydro can do this without my permission. Also have a bank of 13 meters close to my townhouse. What are the rights of strata owners? I won’t go on that “List to delay”.I think it could possibly be a trap. In my opinion if a person puts their name and address on it. this could be construed as consent to install the “smart” meter…only later. I, for one, will not give consent in any form to having one installed at any time! Hi there….thanks for this site…and thanks for the flyers…I spoke at the OCCUPY TOGETHER RALLY today in Nanaimo about these things….and handed out a bunch of flyers…it is amazing to see how many people have not clue about them!! It was just a little piece of paper in with their bill that went into the recycle with the envelope!!! just some feedback…thanks for keeping us informed…I notice that a lot of the info youtube stuff from Ontario and California are not gone…and lot of of stuff on Google is gone too about the meters…there USED To be a lot more in their search engines!! Good luck…let’s get people educated!! B.C. 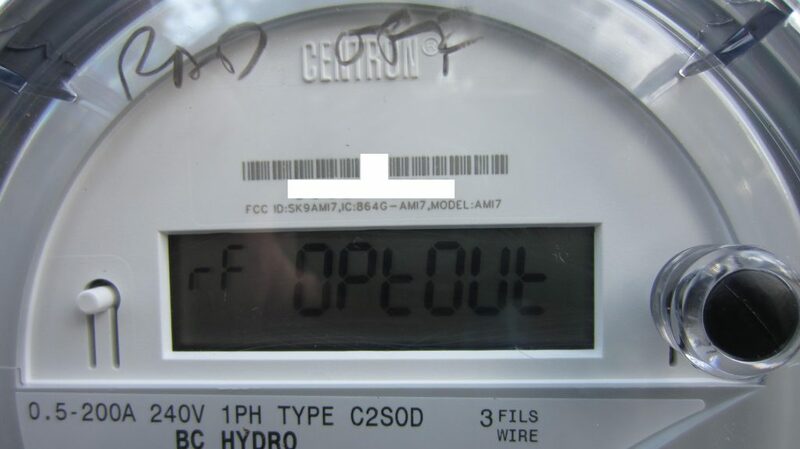 Hydro or CORIX do not have permission or consent to enter my property with the intent of installing a smart meter. I called Hydro and was put through to a phone message system. I left them “Offical Notice” time, date, account number etc that I did not want the meter installed. I will also post the above poster over the meter. when I advised the BC Hydro rep that I had a pacemaker he advised me that they had no problems in california and that if he had to returnto instal the smart meter they would charge me the cost of his return.Feeling threatened by a cut off of electricity I let him instal the smartmeter now I wish I had not. PACEMAKER WEARERS. Do not go near a Wireless Smart Meter. The newer pacemakers can RECORD “incidents”. When you have your next checkup, please have them check for spikes in your read out. Also please phone Meditronics or your pacemaker manufacturer and talk with their customer service people. Your Doctor knows less than you do. Sad, but true. I would like to see a schematic drawing of internal wiring of a smart meter, to see if there is a delay of initial inrush current dropping back to what the load requires, or any other event that would make the wattage inaccurate. cover all arears with a Lead sleave around your Smart Meter leaving face clear . so it will transmit stright forward. This will stop it from receiving a incomming signal . this should work . Place Lead where smart meter is hanging on your wall . Military soulation . did not switch, they are chargeing me an extra $54.08 Legacy Meter charge and $10.00 GST on top of that! What do I do now? I’m furious! Thank-you for the info, is there any kind of recourse for me to only pay my hydro use, and not this extoration, opt out fee, without fear of having my hydro cut off? Or do I have to relent and call them up to come and change my meter, because they got me between a rock and a hard place? bill, as its already overdue, now? I’m being charged for keeping my old meter.